Much has been said and analysed about Paraguay and the Mercosur since the country’s suspension from the trade block last year but after several discussions, diplomatic meetings and public messages a solution is yet to be found. Obviously, there is no easy way back for Paraguay but prolonging the political game, as Cartes is doing, will not solve the issue either. On the contrary, the situation of Paraguay in the Mercosur is not only testing Cartes strength and political ability, but also is making Brazil and regional members increasingly uncomfortable. If the new Paraguayan president is able to demonstrate the political skills necessary to overcome this impasse, he could not only benefit greatly, but also help boost Paraguay’s image with its neighbours. While this is highly doubtful after taking power – which will probably mark the end of the honeymoon period – Cartes should expect a hardening of the stand of his neighbours who will start demanding a quick solution to the problem. On 29 June 2012, Paraguay was suspended from the Mercosur because of the removal of then president Fernando Lugo, following a political impeachment by the Senate, which voted to oust him. Mercosur members Argentina, Brazil and Uruguay described the situation as a ‘congressional coup’ which meant that Paraguay had broken the Ushuaia Protocol on Democracy signed in 1998, that requires member states to have a democratic system in place in order to be admitted and to participate in the trade block. Many at the beginning, included myself, applauded the decision of the Mercosur. Paraguay needed to learn a lesson: if you want to play in the international leagues you need to abide by the rules and if you don’t, then you are out. Until things became sour…Mercosur members at the same time approved the incorporation of Venezuela as a full member, which the Paraguayan Senate had been blocking for years. Under the Mercosur charter all new additions must be unanimous and with all members attending, which was not the case. Many argued that Venezuela was also far from complying with the Ushuaia Protocol and its process of admission was not only considered deceptive but it has also submerged the entire block in one of the deepest crisis it has experienced since its creation in 1991. Last April 15, elections were held in Paraguay and Horacio Cartes was comfortably voted in. Following this, Mercosur in its last summit in Montevideo in July decided to lift the suspension of Paraguay from the block effective 15 August, when Cartes takes office. But Cartes and outgoing president Federico Franco insist on their demands – that Venezuela is admitted into the trade block using the established mechanisms or at least that Venezuela’s acceptance to the Mercosur is ratified by the Paraguayan congress – and claim to be looking for closer trade links with the Pacific Alliance of Chile, Peru, Colombia and Mexico and also the United States. Both, the Mercosur’s decision to lift the suspension of Paraguay from the block and Cartes resistance to return to the international organisation present dilemmas. If the suspension is lifted (which already happened) but Paraguay decides not to return,Mercosur will find itself at a halt. According to The Treaty of Asunción, which established the Mercosur in 1991, the only decision-making mechanism is the principle of consensus with the presence of all states, a necessary mechanism taking into consideration the asymmetry of its members. A consensus implies the absence of objections without the need of a vote by the members. So technically, the Mercosur won’t be able to function without one of its members sitting at the table and voting. Paraguay’s decision not to return will make block members, and especially Brazil, extremely uncomfortable. Brazil has been trying in the last decade to boost its international image but a combination of domestic and regional problems have cast doubt over its capacity to play in the big leagues. Many critics have argued that unless Brazil, which has chosen to take the de-facto leadership of the block, first reaffirms its leadership in its immediate region and solves the problems in the local neighbourhood there is no chance it will become a global player. 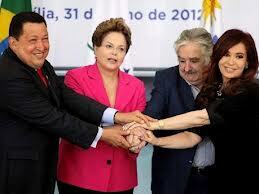 The Mercosur crisis is the perfect case in point and only adds another reason for a headache. But the Mercosur is not the only one facing a dilemma in this scenario. Cartes has no easy options ahead either. Paraguay’s suspension from the trade block revived deep nationalist sentiments in the country, with many claiming it was another affront from our neighbours, just like the War of the Triple Alliance (a war between Paraguay and Uruguay, Argentina and Brazil which devastated Paraguay. Paraguay suffered catastrophic losses in population and was forced to cede territory to Argentina and Brazil). Paraguay also publicly denounced that its ‘dignity had been abused by Mercosur members’ and ‘that the whole legality of the system has been broken down’. This means that Cartes can’t just decide to simply go back as a full member of the block without a public uproar. Furthermore, Cartes has historically had a pro-Brazil stand and has worked hard to gain Brazil’s approval and support, all of which can now be jeopardised. Probably the only (and ideal) way Cartes can try to solve the issue is by taking the subject to the Paraguayan congress and expect they vote to ratify the acceptance of Venezuela as a full member. The Colorado party has majority in both, the lower and upper house of congress, and could technically do this. But the decision will probably come at a high cost for Cartes, who will have to use a lot of his political capital to get the deal approved. If he manages to obtain the votes needed to ratify Venezuela’s acceptance to the block he will not only avoid public turmoil, at the end he can always blame it on the Congress, but he will also be able to re-establish positive relations with the region and bring Paraguay out of the international isolation it has been suffering since June last year while at the same time gaining full approval and support (and God knows what else) from Brazil, a key strategic partner in the region. The move will put to test not only Cartes’s political skills but also a fundamental question about power management within the Colorado Party, is Cartes able to shape and control the Colorado Party or is the party going to shape and control him? Regardless of the result, it will have long-lasting consequences for Cartes government, which is probably why he has opted to prolong the political game. In the meantime, while the drama unfolds, stay tune for the next chapter of the Mercosur political soap opera.